The Christmas lights are going up next week and I'm already starting to wonder: where did 2016 go? It's hard to believe that 200 days have passed since Nvidia first unleashed the hard-hitting GeForce GTX 1080, yet what's perhaps even more surprising is that the initial jaw-dropping price has hardly budged. If anything, a lack of competition in the high-end space has given Nvidia's partners license to produce elaborate variations priced even higher up the ladder, and when you factor in the devalued pound, it's no wonder that the very best GTX 1080s are now commanding up to £800 at retail. Inno3D tends to undercut the competition and its latest entry in the enthusiast space comes in the form of the £720 iChill GeForce GTX 1080 Black. The price tag can make you go weak at the knees, yet while the figure is nearly a £200 mark-up on the most basic air-cooled cards, it's also relatively conservative for a liquid-cooled GTX 1080. And hey, what's a couple of hundred pounds among enthusiasts? If it's bragging rights you're after, the Inno3D card should strike a lot of the right notes. The dual-slot board comes pre-plumbed with a pair of flexible rubber pipes attached to a 120mm radiator. What's interesting is that Inno3D takes a hybrid approach, so rather than having a waterblock encompass the entire board, the pump deals solely with the GPU while a heatsink and fan cools the MOSFETs. It's a case of personal preference as some may prefer the added airflow while others will lament the use of two fans. The card itself feels robust, with Inno3D using a full-size backplate for added reinforcement, however we do reckon there's room for more refinement. The white 120mm fan that attaches to the radiator is an odd choice of colour, and considering that the card sources juice from the PCIe slot as well as 8+6 cables, it's a shame that the liquid-cooler pump needs a separate Molex connector for its own power requirements. 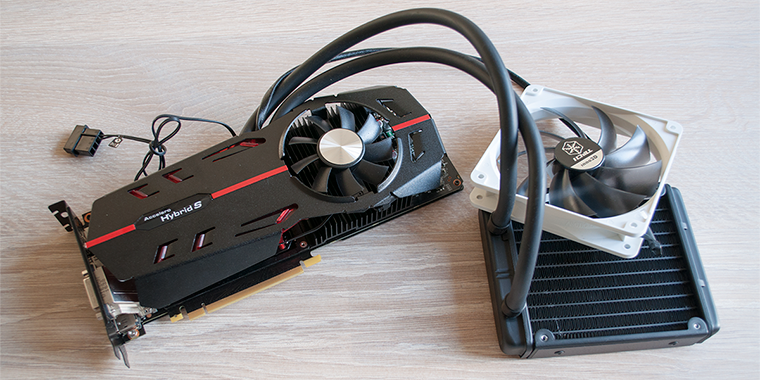 Should you be wanting to keep your build looking tidy, you'll appreciate that the card's 266mm length is a match for Nvidia's Founders Edition and comfortably shorter than Inno3D's triple-fan iChill X3 behemoth. Do bear in mind you'll need to find room inside the chassis for the radiator and fan assembly, but as a whole it's a neat and tidy solution. Reiterating an earlier point, the only caveats are the distracting white fan and the awkward-looking Molex power cable sticking out of the top. Better-than-reference performance is a prerequisite for a card of this ilk, and shipping frequencies are raised accordingly. Base and boost clocks are increased from the default 1,607MHz and 1,734MHz to 1,759MHz and 1,898MHz, respectively, while memory climbs a fraction from 10,008MHz to 10,408MHz. Another interesting consideration is radiator placement. 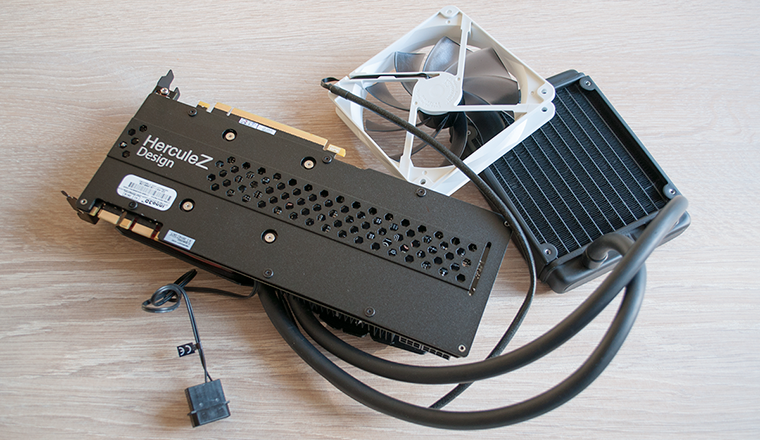 Inno3D's tubing is long enough to support a choice of fan mounts in most chassis and though the manufacturer's documentation suggests a number of different orientations, it reckons that a front-mounted radiator with the 120mm fan acting as an intake would deliver the best GPU cooling performance. If keeping noise to a minimum is a priority, it's worth noting that the onboard 80mm fan turns off when idle, while the radiator fan spins at all times. Elsewhere, there are two backlit logos - the iChill branding across the top and the Accelero HybridS down the middle. Illumination is not uncommon on high-end graphics cards, and though I personally tend not to care for it, I can appreciate the simplicity of Inno3D's implementation. The lighting requires no additional software, is reasonably subtle, and also changes colour to highlight GPU load - the lights are blue when idle, green at medium load and red when the going gets tough. Looking beyond the liquid cooler, the iChill GTX 1080 Black shares plenty in common with the Founders Edition. A couple of SLI fingers are present and accounted for, while the five default display outputs - dual-link DVI, HDMI 2.0b and a trio of DisplayPort 1.4 - are arranged on a black I/O plate that's vented for airflow purposes. Ready for some numbers on a refreshed suite? Let's get to it.